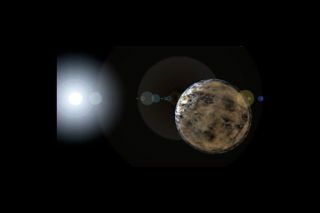 An artist's impression of an exoplanet orbiting the well-known, nearby F-type main sequence star Procyon, the brightest star in the constellation Canis Minor. The stars in the night sky shine in myriad hues and brightnesses—piercing blues, clean whites, smoldering crimsons. Every star has a different mass, the basic characteristic that determines its size, lifespan, light output and temperature (which we discern as a particular color). Yet when it comes to the existence of life, we know with certainty of only a single star—a toasty, yellow-whitish one, our Sun—that has permitted the rise of life on an encircling world. Astrobiologists are quite convinced, though, that life can also develop on planets orbiting smaller, cooler stars. The new study specifically considers how the higher levels of ultraviolet (UV) radiation cranked out by F-type stars could hinder the development of alien life. UV rays can alter or destroy the molecules, such as DNA, that are deemed necessary for carbon-based biochemistry. Another drawback of F-type stars, as the study conveys, is that they live shorter lives than slower-burning stars like the Sun as well as orange (K-type) and red dwarf (M-type) stars. This variable is important because life, as we understand it, needs a lot of time to get going and to eventually evolve complexity. Furthermore, the more massive a star is, the rarer it is; tiny M-type stars vastly outnumber G-type stars, which in turn outnumber heavier F-type stars. However, the new paper cautions completely writing off the rare, ephemeral, UV-blasting F-type stars as incubators of life. Instead, F-types likely represent the brightest and hottest main-sequence stars that could plausibly allow life to form. "It has been argued that the most likely host candidates for exobiology should be K-type or even M-type stars based on their relatively long life spans and high frequency compared to the other types of main sequence stars," said paper co-author Manfred Cuntz, a professor of physics at the University of Texas at Arlington, and lead scientist of the project. "But the only case known for life to exist is the environment of our Sun, identified as a relatively hot and massive G-type star." "Therefore," Cuntz continued, "it appears to be fully appropriate to explore the possibility of exobiology for stars even hotter and more massive than the Sun." Representative star types in the Morgan-Keenan system, with the smallest and coolest on the left, called M-type, on up to monstrous, hot, short-lived O-type stars on the right. Astronomers classify stars by the sort of the light they emit. Underlying this characteristic is the essential property of mass. The amount of matter stars contain determines not only their surface temperature, but their size and lifetime as well. More massive stars generate stronger gravity; stronger gravity creates higher inside temperatures and pressures, therefore making the stars' nuclear fusion furnace much more efficient. Atomic nuclei fuse at higher rates and release more energy in compressed conditions. As a result, more massive stars put out more light and heat as they burn their nuclear fuel at a faster pace than cooler, less massive stars. F-type main sequence stars have a mass about 10 to 60 percent greater than the Sun's. That added mass gives the star a surface temperature ranging from about 10,500 to 12,500 degrees Fahrenheit; for comparison, our Sun's surface is a bit shy of 10,000 degrees Fahrenheit. Stars' hotness determines their color and thus their classification according to the standard Morgan-Keenan system. This letter-based classification system runs, from the bluest and hottest stars to the reddest and coolest, as follows: O, B, A, F, G, K, M.
Accordingly, Cuntz and colleagues see no reason why life would not have a sufficient "window of opportunity" to arise on worlds bathed in an F-type star's light. "The lifetimes of F-type stars on the main-sequence appear to be sufficiently long for life having a chance to start and to flourish," Cuntz said. Ultraviolet radiation can damage DNA molecules, causing "rungs" in its ladder-like internal structure to improperly bond with each other. The light from F-type stars, however, is more intense than that from our Sun. Hotter stars churn out more higher-energy forms of light, such as UV, than their less massive cousins, which can make a profound difference when considering habitability. The study by Cuntz and colleagues considered F-type stars in the mass range of 1.2 to 1.5 times that of the Sun. The researchers gauged the damage that these representative stars' UV rays would cause to a DNA molecule. The amount of radiation received by the molecule was pegged to a hypothetical planet situated at a position equivalent to Earth's orbit (thus, the model planet's orbit was a bit farther out from its hotter, F-type star than Earth's). The scientists calculated the DNA damage through what is known as an action spectrum, which is a measure of the degree of destruction or alteration of molecules under the influence of radiation. The results: DNA molecules under the glare of an F-type star would suffer 2.5 to 7.1 more damage from UV light compared to that inflicted by the Sun. Life-friendly hydrocarbon molecules would suffer serious degradation, potentially enough to wreck the delicate chemistry that underlies biology. Game over for life? Not quite. The preceding figures did not take into account the extent to which shielding of some sort—say, an atmosphere or submersion in water—could block some harmful UV rays. Most biologists think life arose on primordial Earth in an aqueous environment anyhow and perhaps well beyond the reach of UV rays at hydrothermal ventson ancient ocean floors. Similarly, by living underwater, or underground, Cuntz said, primitive single-celled creatures could survive on a world awash in heavy UV light from an F-type star. The development of multi-cellular, complex life on a planet around an F-type star, though, would require the sort of UV protection afforded by an ozone layer. Earth has just such a layer, high up in the atmosphere, of ozone molecules composed of three oxygen atoms. The layer absorbs nearly all of the highest-energy and thus most dangerous kind of UV rays, dubbed UVC. These rays would otherwise penetrate to our planet's surface and could kill off exposed life forms. Some less-energetic UVA and UVB rays still reach the ground, where they damage our skin, causing sunburns and skin cancers. Water can act as shielding against harsh UV rays that might hinder the development of life. In a seeming paradox, the Earth's protective ozone layer is actually thought to have arisen thanks to life. Early in our planet's history, photosynthetic life—partially shielded from UV rays by water—loaded the atmosphere up with the oxygen gas that then reacted with sunlight to produce ozone. Accordingly, simple life paved the way for more complex life as an ozone layer took hold; such a stepwise evolutionary process could transpire on an F-type star's planetary bodies. Cuntz pointed out that extra UV light exposure should not be construed as a wholly bad actor. Although it can damage biomolecules, UV could also give burgeoning life a handy spark, providing a source of energy. It could also be helpful to jumpstart the origin of life by providing a highly reactive biochemical environment. "Broadly speaking, UV should be considered both a friend and a foe to the principal possibility of life," Cuntz said. "At the present stage of Earth in regard to many of its life forms, the lack of an ozone layer would be truly harmful to most types of surface life. On the other hand, in regard to life's origin and early stages of evolution, a notable UV intensity could be important for facilitating the onset of life by triggering relevant early-stage biochemical reactions." More, but not too much more UV exposure could even provide a biological bonus by causing DNA to mutate more rapidly—the very essence of evolution, especially during its early stages. "UV could also support accelerated evolution through initiating mutations," Cuntz said. Another boon to F-type main sequence stars is its expanded climatological “habitable zone," the temperate band around stars where orbiting planets can maintain liquid water on their surfaces. Habitable zones are usually measured in astronomical units (AU), the average Sun-Earth distance of 93 million miles, equaling 1.0 AU. A bit more nomenclature: Our Sun is technically a G2 star; in the MK stellar classification system. The digit after the lettered spectral class refers to how far along a continuum, numbered 0 through 9, that the particular star ranks, with 0 being closest to the next-hotter spectral class and 9 the farthest. Thus, a G2 star is warmer than a G7 star. Stars hotter than the Sun, such as F-type stars, have more extended habitable zones, while stars cooler than the Sun have comparatively tighter orbital bands where water can remain liquid on a planetary or lunar surface. The paper cites prior work gauging a relatively hot F0 star as possessing a habitable zone extending from about 2.0 AU to 3.7 AU—a band more than twice that of the Sun's, reckoned span of 0.8 AU to 1.5 AU. The habitable zone for a comparatively cool F-type star, an F8, meanwhile, extends between 1.1 and 2.2 AU. It follows that exoplanets placed at the outer edges of their respective F-type star's habitable zones, and orbiting lower-end F-type stars rather than those roasters bordering on the A-type star category, would receive less UV light. Ultimately, given the various considerations in the paper, life should stand a reasonably good chance of developing in the cooler, less-severe-UV realms about F-type stars. The cons of F-type main sequence stars—more UV, shorter stellar lifetimes—do not eliminate them from astrobiological contention along with their smaller cousins, G-type, K-type and M-type stars. "When it comes to evaluating F-type star planetary habitability, it is necessary to keep an open mind on the various important and intertwined topics of exobiology, and to promote future research," Cuntz said.